Democratic Party (N.C.). 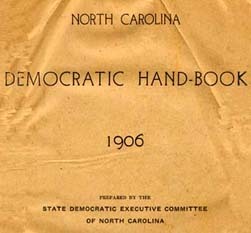 State Executive Committee North Carolina Democratic Hand-Book 1906. Prepared by the State Democratic Executive Committee of North Carolina. North Carolina Democratic Hand-Book 1906. Prepared by the State Democratic Executive Committee of North Carolina. Raleigh: E. M. Uzzell, . Campaign literature -- North Carolina. Democratic Party (N.C.) -- Handbooks, manuals, etc.